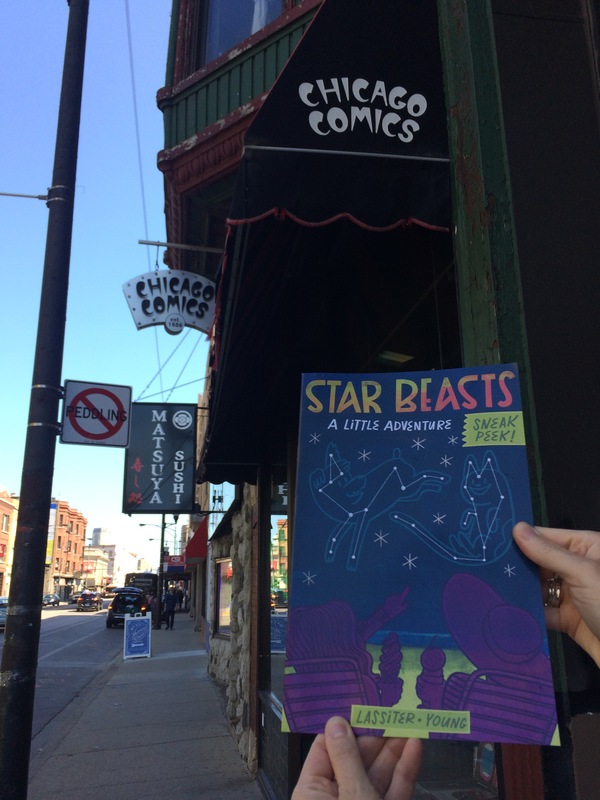 The amazing humans at Chicago Comics have free copies of our Star Beast Mini Comic. 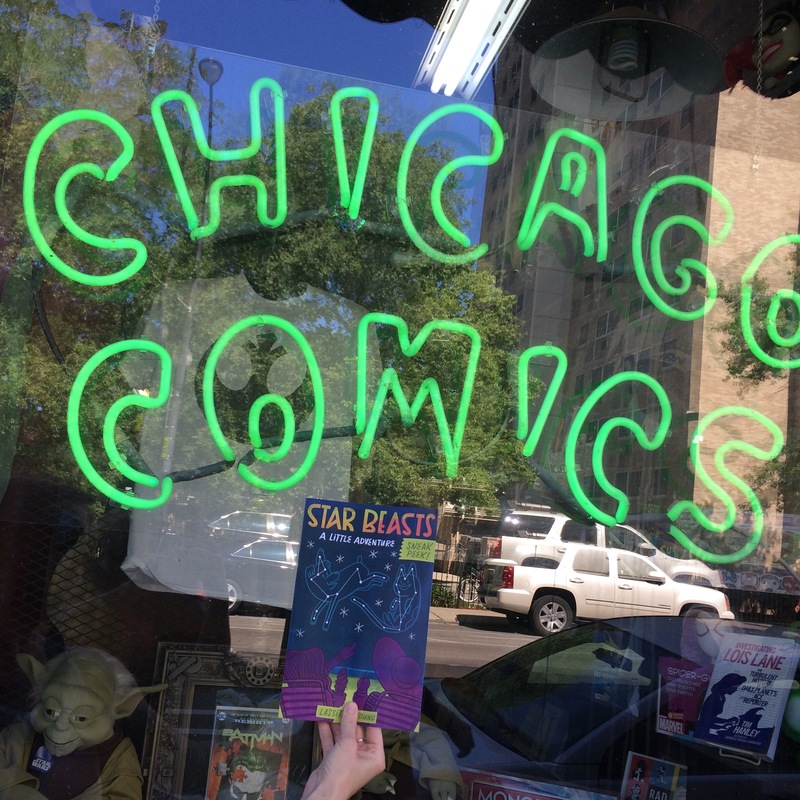 If you’re in the Windy City, stop in, buy cool comics and pick up freebie. Tell them the Star Beasts sent ya! I think she captured the personalities of Zayd, Karma, Maria, Clio, and Eleanor perfectly! Quite an accomplishment for not even having a chance to see them in action yet. If this isn’t motivation for me to finish the art for issue #1, I don’t know what is! We would love to see more fan drawings from you all! You can tag your art on Instagram or Twitter (#starbeastscomic) or email us (starbeastscomic@gmail.com)! If you want to check out more of Katelinn’s awesome comic art, visit her Deviant Art Page or follow her on Twitter! New Fun Space Stuff at Hallmarket! Here’s a glimpse at our new buttons that will be available at Hallmarket this Saturday! There are 30 different designs to choose from! Can’t wait to see you all there!! Star Beasts Land At Hallmarket! Check out our new Star Beast Space Stuff at Hallmarket in Kansas City this Saturday. The Condor Crew will have new character pillows, new buttons, trading cards, stickers, the teaser comic (in case you still need one) and of course PET SPACE ROCKS! Blast on by and say Howdy! Well she was a pretty easy one to nail down the look for. I had a pretty good image of her in my head, and I drew it out pretty easily. I love it when that happens!! I think part of the reason she came together so quickly, is that she’s just so fish-y! Most of our other heroes are physically anthropomorphic (or, they have a human-like body). But for Clio, I wanted her to look more like a fish… with a fish body! So here she is! The only real problem we had to solve with Clio, was how she gets around in an environment filled with air. A fish needs water to survive, so she needed to have some kind of container of water surrounding her. Maybe something like what Spongebob wears when he visit’s Sandy’s treedome! My initial thought was to give her a fish bowl… maybe a fish bowl with rocket control that could fly around wherever she needed to go. But instead I landed on just a glob of floating water. That way she can stick a fin out in any direction to grab a shell book off a shelf, or shake hands with a creature diplomat, or interact in any way with the world of air around her! I know what you’re thinking… “how does that work! ?” well, I don’t exactly have the credentials or scientific knowledge to answer that question. I’ll just have to refer you to Doctor Curly on this one!